Running is what those in The Woodlands Running Club did today, like almost always. 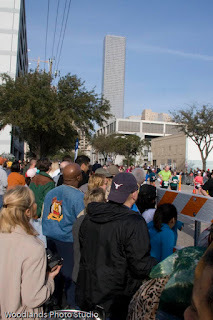 123 members participated in the Houston Marathon event which started and ended in downtown Houston. 78 members competed in the marathon, 40 in the half marathon and 5 in the 5K. The first wave on contestants fired off at 7AM (after the handicapped entries). 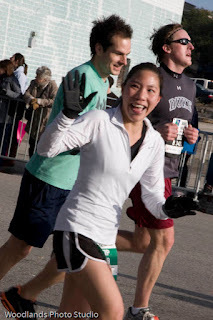 Our weather was perfect for a runner and spectator alike - clear and nippy. There were plenty of spectators, many more than last year. 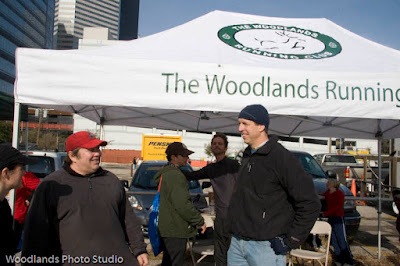 The Woodlands Running Club tent in support of its members at the Houston Marathon. Shown left is current president Bill Dwyer. John Laskowski is in front of the tent. Randy Smith & Micah McGee in the background. Juliee Sparks to Bill's right. The club will have a post run party this evening. 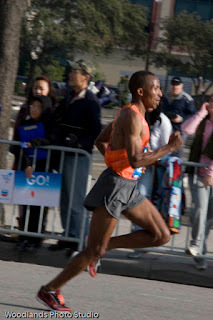 Marathon winner, Teshome Gelana (Ethiopian) near the finish line. 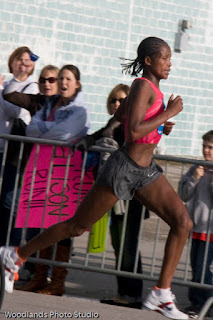 First lady to finish, Ethiopian Teyba Erkesso . Now this cowboy did it in style. 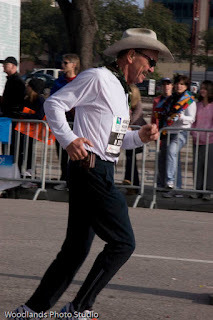 How would you like to wear a white dress shirt and long pants with a cowboy hat on a half marathon? You could easily discern that he was enjoying himself! Looks like something a Woodlands resident would do, or not? I am told his name is Bill. His time was great, but what Texan wears running shoes? OK, so my boss outlawed running shoes at work. Maybe I am a bit sensitive about that subject right now. Boots it will be. Still, this guy did not have any wrinkles in his shirt. There is something basically wrong with this. Lady in the foreground is completing the half marathon race (13.1 miles). She is moving to the rhythm of the music. 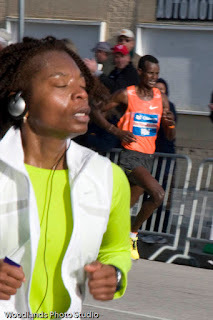 The guy behind her is a professional runner completing the marathon (26.2 miles). Compare the two expressions. They departed at the same time and arrived near the finish line at the same time. Greeting family members is a regular ritual. One guy runner kissed his spectator wife near me on the sidewalk. She said that was a good excuse to rest, but she was grinning from ear to ear - she loved it! A lady runner also came to her partner and kissed him. He was not quite so enthusiastic about the gesture. Recognition of effort and accomplishment - that is what it is about. You run for sport, social contact and health. 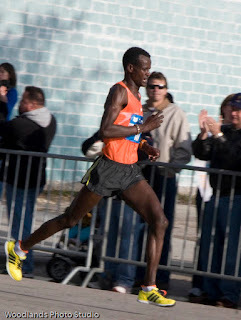 The word for the feeling derived from and during the running of a marathon or half marathon exceeds my vocabulary. You hope for family support and most get it, as evidenced by the large spectator crowd with posters and yelling at the top of their lungs for their runner to recognize that they were there for him or her. 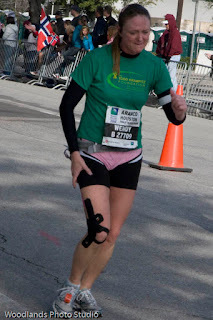 Finally, do you think you cannot run a marathon or a half marathon? My special "tip my hat" respect goes to this young lady in the half marathon. Look at her grimace as she sets her determined effort into the last part of this race. Her time was not that bad either! She came in about 1/2 hour after my daughter finished her race. And by the way, my daughter ran an excellent time. So think about it. I started at the age of 63 after witnessing a similar effort by someone else. What is holding you back?